Have any of you played in other bands? Kabir: We’re all pretty experienced and have played in various bands at a similar level to this. I’ve been lucky enough to tour the UK and Europe in previous bands and played guitar for other singers and songwriters. How is it that you started playing music? Kabir: I remember seeing bands on TV as a kid and wanting to try it. I got my first guitar when I was 13 and then was soon fascinated by songwriting. The process of creating something seemingly out of thin air was pretty amazing to me. What are your names? / Who plays what? Kabir: I sing and play guitar, Ross plays bass and Enzo plays the drums. Enzo and Ross also do backing vocals. I write the songs and we arrange them within the band, changing things as we try different ideas to improve on the basic idea. Have you had other previous members? Kabir: Yes, Brandon was our original drummer but he left to go back home to the States, and Malcolm, who we still see at gigs, who left to have a family. Did you make music even when you were young? Kabir: I played violin for a while when I was about 10 or 11, if that counts! Where are you from? Kabir: Ross and I are from near London and Enzo moved from Sicily to play in bands over here. What's your style of genre? Kabir: Alternative rock or indie rock, call it what you will. It’s songs with loud guitars, and sometimes just a bunch of noise! What inspires you? Kabir: To write? It could be anything but you have to keep your eyes and ears open to it. It could be something in your own life, or a phrase you read, or an interaction you have, or a conversation overheard or an observation you make. It’s almost like walking around with a gigantic funnel and stuffing as much as you can in there and grinding it up for your songs! Hahaha!! How often and where do you rehearse? Kabir: We rehearse when we can, usually in North London. How have you developed since you started with the music? Kabir: I hope we’ve improved as musicians and writers. As a person, music, and songwriting in particular, has allowed me to put my emotions and thoughts down on paper, to work them out and sometimes come to a conclusion. Some people have diaries for that sort of thing. I use songs. And playing always make me feel better so it’s therapeutic too. Do you have other interests of work outside the band? Kabir: Well the band is what we do outside of work, because we all have day jobs. But recently I’ve been reading a ton of books. Biographies, science fiction, all sorts. I can’t believe on what I’ve missed out on! I just never made the time to do it before. Are you looking for a booking agency, and what are your thoughts around that? Kabir: We’re not at that stage yet, but when we need one we’ll look for one. People are always looking to make something from you, so until there’s something in it for them, we won’t be bothering them. Until then, we’ll book our own shows and tours. Are you looking for a label, and what are your thoughts around that? Kabir: Same as above, really. We make our own records as we like them, releasing them through our own label with no interest from “the industry”. Labels and agents are a great source of contacts and support, though. Doing it yourself without a major fan base or contacts is a very hard, and often lonely, road. What made you decide to make this music? Kabir: I liked the energy of rock music, the tribal stomp. That was it really. It’s a simple form, but still offers quite a wide range of possibilities in terms of sound, orchestration and dynamics. What are your songs about? Kabir: Depends what the source of inspiration was but it’s quite often about the feelings and emotions of an individual, somehow having some internal conflict or strife. That’s pretty common to everyone, so if people get to hear it I hope they can relate to it and get something out of it. Do you start with the music or the lyrics? Kabir: Sometimes you think of a line of a song and a melody to go with it, and the song flows from there. Those are the best because they sound more natural, rather than twisting a melody to fit a line or the other way round. I do more writing on the computer now so I might work up a verse, or a chorus, and build a song out that way. Sometimes I’ll have a complete arrangement of a song in the computer and only have lyrics for one verse and half a chorus! The gap between inspiration and a finished recording of a song can now be less than a day if it all works out. There are so many ways of doing it now, but you just have to make sure you finish what you start. Do you compose in a certain environment? Kabir: I always compose at home with either an acoustic guitar or, more commonly now, an electric plugged into the computer. Have you done any covers live? Kabir: No, we’re an originals band. What are the least and most people to attend one of your gigs? Kabir: Least, probably about 20 in a tiny basement venue in North London. It looked packed because the place was so small though! I’m not sure what the biggest attendance is though. Maybe around 100? Do you always play the same songs live, or do you vary? Kabir: We vary each gig. I guess if you’re a massive touring band with lighting cues and off-stage triggers to organise, a fixed set list might be of benefit, but even then you’re going to want some variation to keep the interest up. Do you have a regular place you play live often? Kabir: No, we just play in the venues the various promoters run. They want you to bring a crowd, so as long as we have interested people there to see us we can make just about any venue work. What was your first gig like? Kabir: In this band, it was very loud on a sweltering summer night. The place was busy with our crowd and the fans of the other bands playing that night. It was a great start! What was your latest gig? 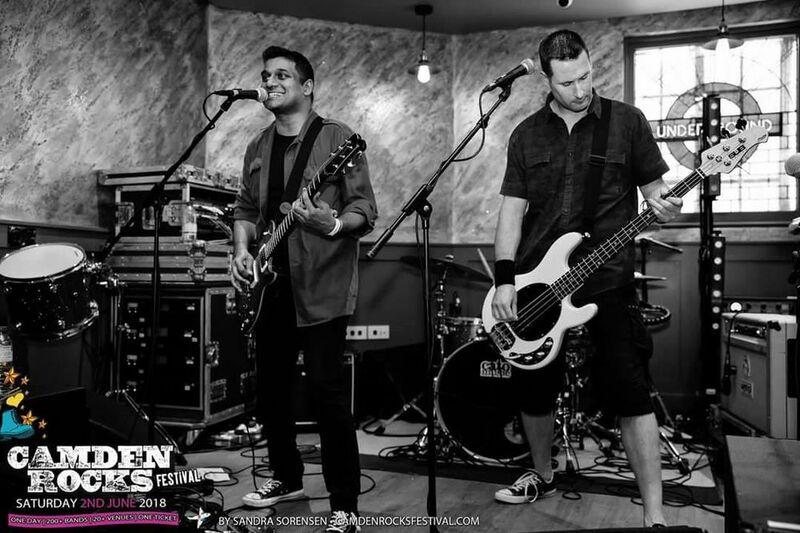 Kabir: We made our debut at Camden Rocks and being part of the festival was awesome. We were all pretty psyched up and had seen a couple of acts before we went on. The crowd was really supportive and the sound guy and stage manager made everything sound and really n great. We had a brilliant time. Where have you played live this year? Kabir: London clubs. That’s our stomping ground! Where do you plan to gig the coming year? Kabir: We’re looking to do some gigs outside London later this year, maybe even a tour. It depends on availability and cost, really. When did you start to sell merchandise, and what do you have for sale? Kabir: We have both our albums for sale. Our 2015 debut, The Pain Inside Your Head, is available at iTunes and Amazon, as is our recent album, Braveface, which came out in April. You can also get CDs from our website and at gigs. We also have T-shirts, wristbands and the usual merch with us when we play and online. If you go to our website or a gig, you’ll be able to find it. What do you think about people downloading music instead of buying records now a days? Kabir: Well people don’t even need to download now as they can stream. Personally I like vinyl, and CDs and there is still a place for that. But people will do what’s best for them. It’s very convenient to stream an album, and for £15 a month for all the music a family could want it’s an unbeatable deal. Yes, the artist royalty rates are terrible but they were terrible before the internet too! Most people’s interest in music is peripheral. Those who want to dig deeper, can still do so, often interacting directly with the artist, which was unheard of before the 2000s. Ultimately, we make the music, the label makes it available and fans can choose how they consume it. Sounds like a good environment to me! How do you think the music industry have changed because of this? Kabir: I have nothing to do with “the industry”, and nothing against them. If their income streams are threatened by changes to music consumption, they’ll branch out like they have done with merch deals and will monetise their acts in other ways. You can see them all merging and being part of bigger and bigger entertainment corporations. They’ll do what they need to in order to survive. We’ll just keep churning out the best music we can! Is it easier to find inspiration from older bands, or bands that are more active to day? Kabir: Inspiration can come from anywhere, whether it’s a new act or an old one. The inspirational qualities in Led Zeppelin or James Brown records is still there, so if anything it adds to what’s current and inspiring. What have been your biggest obstacles? Kabir: Translating interest into action. Getting interested people to gigs, getting albums sold, getting our tracks onto radio. We’re still working on all those. What advice would you give other bands or artists? Kabir: Stick at it, and don’t let anything make you bitter. How do you get psyched for a gig? Kabir: I like to make sure the house is clean and tidy before I leave for sound check! Seriously!!! It doesn’t take much to get psyched. Once I’m at the venue the adrenaline already starts flowing! Do you have any new material? Kabir: Yes, we’re writing all the time. We’ve already got enough for a new album. Whether it’s all album quality is another matter, but as long as we’re writing we can keep working on improving material, and rejecting things that don’t work, until we’re happy. How can people reach you? Kabir: Via any of the social media platforms, email or at gigs. Just come up and introduce yourself! What are your plans for the future? Kabir: We really want to see the new album, Braveface, in the hands of a lot more people. We want to play more live shows and book a short tour too.